Today on homify 360 we visit a quaint cabin… a home away from home, with the aim of living in barbecue heaven. 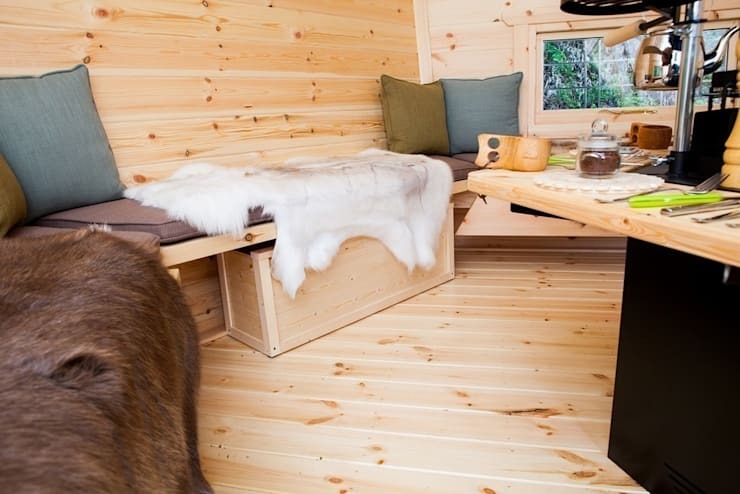 This adorable barbecue hut by Arctic Cabins is a nature lover's dream! It's a pint sized 10 metre square floor space has enough seating for a party of 15, while a lucky two or three can actually spend the night in this wooden space made from sustainable Arctic pine. The cabin boasts three double glazed secure windows as well as a double glazed door with a mortice lock for optimum safety! What makes this cabin even more amazing is the central barbecue grill with a fantastic space saving table fitted around it! Camping has taken a whole new level of glamping. From our first glimpse at this cute wooden cabin, it seems like a fantasy! It's a fun space to enjoy the company of good friends and close loved ones, don't you think? 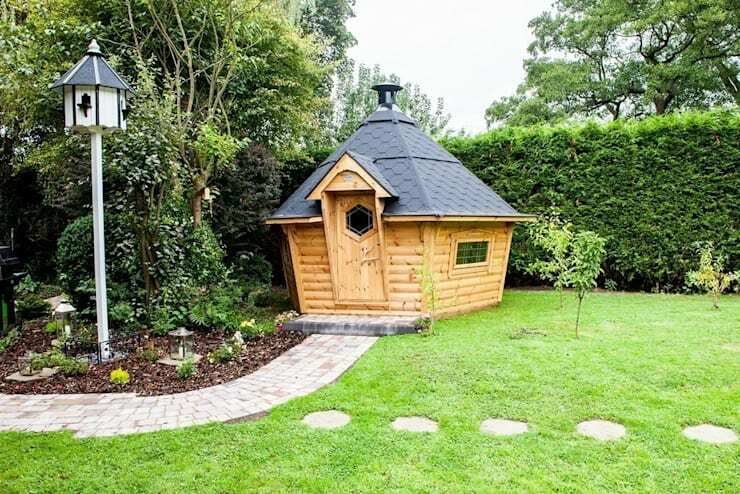 This barbecue cabin will be a great alternative to a summerhouse or shed in your garden. The addition of something so amazing in your backyard will definitely be a topic of conversation at your next family get together! Just think, now you can have a fantastic space to barbecue regardless of the weather and spend time with family and friends in rather close quarters! Who said bonding needs to be in the great outdoors? 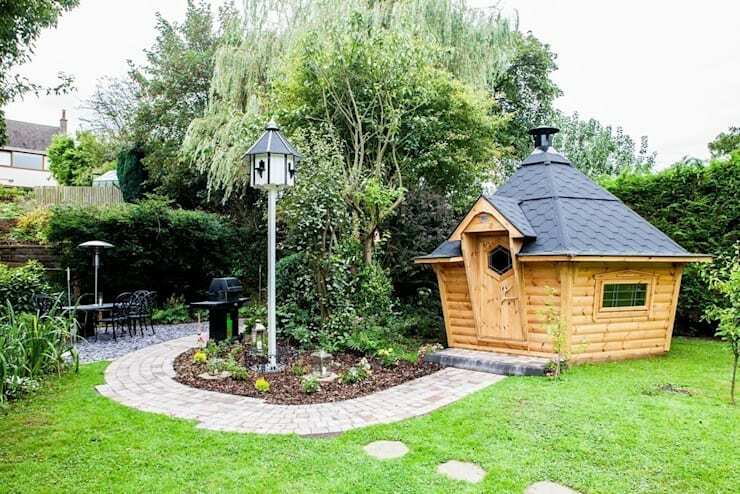 Installing this beautiful little barbecue cabin in your garden would add that touch of mystery and fascination… perfect if you have kids with a wild imagination. However, it might be just as important to create a great setting for your cabin too, a garden that creates a similar air of mystery. The pathway leading up to the cabin will ensure that your green lawn remains perfect and unspoilt by erosion, while the street lamp style lighting means you can use your cabin at any time of the day. Each aspect of this garden has been carefully planned, and we totally love it. Now for our first glimpse inside! 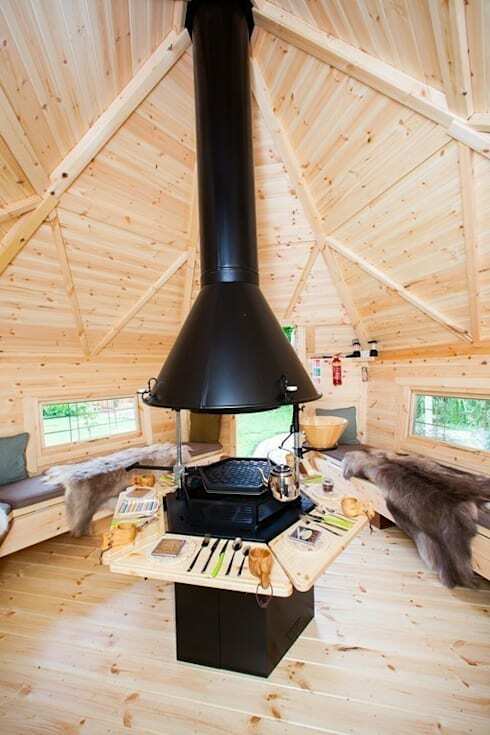 The interior of this fabulous wooden barbecue cabin has a great home away from home setting! The three windows create an opportunity for natural sunlight to become part of the interior, making it comfortable and cosy. The exposed wooden walls enhances that cabin look and feel. This space is wonderful in that in has a Scandinavian lodge style, very different to the standard outdoor shed experience! It not only has a fantastic place to eat off the grill, but with the beds located along the wall and animal hide rugs and throws, this cabin is a special camping inspired space too. A barbecue cabin with a built in grill idea such as this will make anyone decide to include it in their home, if they are lucky enough to have space. This type of grill has all the flavour and texture of the traditional barbecue, but with the added convenience of being usable throughout the year. This fitted seating area has family style eating written all over it and might just replace the traditional barbecue style with its well-planned eating area! It's certainly a delicious idea for any garden space! Move over outdoor barbecue… there's a new cooking style in town. Seating and rugs inside a 10m² Barbecue Cabin in a Derbyshire garden. The cabin has space for up to 15 people to be seated for meals, but what about this great option for overnight guests? It's a fun camping experience in your own backyard! Now instead of sending your teenage kids into the woods for a camp, they can now be under your watchful eye at their next sleepover. The cabin even has storage space beneath the bunks to ensure that the space looks neat and tidy. It's a small cabin so the last thing we need is clutter! These hand-crafted wooden boxes can be used to store backpacks or even non-perishable items… the cabin just got so much neater. 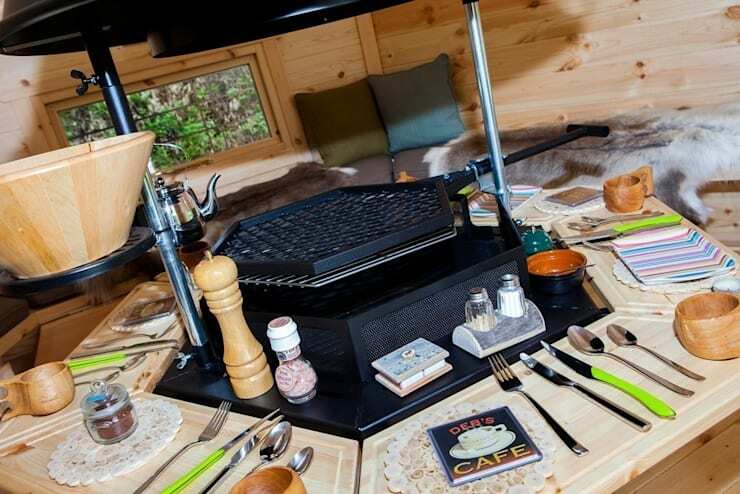 Some of the accessories inside a 10m² Barbecue Cabin in a Derbyshire garden. We already know that this cabin has been planned accurately, but we haven't looked at the details of the style. 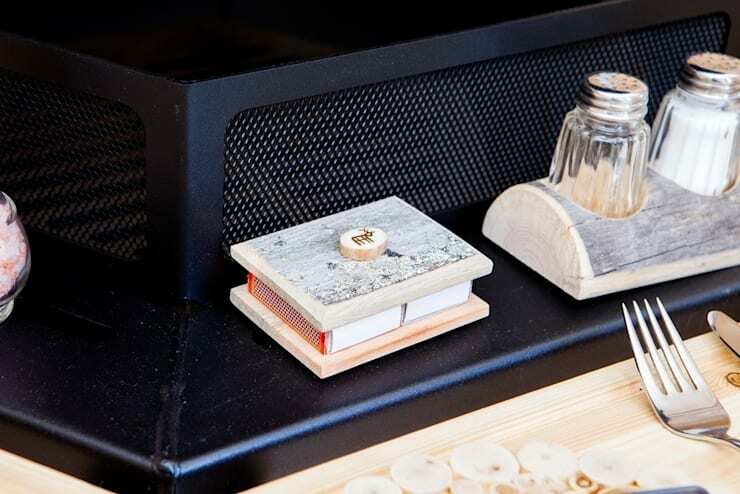 The condiment holders and matchbox container even has a wooden touch to it! That's a perfect match for the wooden cabin. This structure has all the parts and pieces of an outdoor adventure, but with the comfort and simplicity of being just steps away from your home! Who says you can't recreate the great outdoors experience? If you are looking for more barbecue ideas, then checkout: It's braai season so design your perfect BBQ area. Would you enjoy a wooden cabin in your garden for a daily barbecue?